Santal majuscule is a popular perfume by Serge Lutens for women and men and was released in 2012. The scent is woody-spicy. It is still in production. That's great! Serge Lutens invites you on a little trip. Light as a feather streaks of liqueur, a world-forgotten heart of truffles, dried flowers of the rose. The composition is simply overwhelming, never overloaded and yet hardly tangible. Very slowly, a subtle sandalwood note makes its way, fantastically integrated, respectful and free of airs and graces. A fragrance that ecstasizes. Everything is light, a sylph-like touch. Perhaps the most beautiful sandalwood scent I have ever had the pleasure of meeting. Thank you for this masterpiece. I would like to write comments again. Recently I was wondering if I could become a silent reader again. Some things I simply didn't like and I felt it better to avoid any form of communication. So be it. My motivation has clearly increased again and I don't want to miss certain things. Among other things the souk as well as the function to tell people my personal opinion about scents. Like last year, I ended up in Mexico. Different place, but again the same country. The hospitality, the quality and also the country as a whole convinced me. The weather was great, the sea turquoise blue and also the beer tasted good. Small incision: Besides Santal majuscule I had the Chanel EDB with me and Havana from Aramis. Especially SM does not fit into this time and into the climatic conditions. In general, I wonder whether perfume is "bearable" there in summer. The EDB was extremely overblown and got on my nerves. I should be taught the better. One evening - incredibly oppressive - we went to the bar. Me without a perfume. On the way - the plant was huge and we wanted to go to our regular barkeeper - a group of young women passed us. So nice so good, but I heard a nice note of bitter cocoa, which had a slight floral touch when I smelled it more closely. I mumbled as I went on: "Santal majuscule, the woman has style. The head-shaking looks of my boys - can start zero with my hobby - exposed, less than 5 seconds later one of the young women stood beside me and asked me: " I guess it could be wrong, but did you say Santal majuscule?" The beginning of a friendship. Together with her friends we went to a common table and beyond that we spent our days there together. We both talked about several brands, the fragrance compositions and the quality. She was happy to have met someone who shared a similar passion. I could agree with that and I was just as happy to be able to perceive fine sandalwood soaked with cocoa and a fine pinch of floral notes (rose) for a long time, despite the sultry weather. Sometimes it's so easy, even though it seems so hard. How nothing at all emerges from weeks of conversations and then again such a short moment brings about friendships. It's the most trivial things that can create friendships. This includes simply looking well-groomed and smelling good. Beautiful Sandalwood perfume it is ! Its a very complex perfume and this is the feature I like the most. Serge Lutens has won million hearts and with gem one more an has increased !!! Of course I like it ... it's Roses!! Thanks to my dear friend Ysbrand I have a sample of this to ruminate over ... and I must say that as a widely publicized Lutens sceptic, I find Santal Majuscule more accessible than many others from this house I have tried. I'm not going to rush out and buy it ... but I find myself in the position of giving it a favorable review :). It's the delicious Rose, of course, that causes the smile on my dial ... in complete opposition to the same flower in Sa Majeste, which wilts, dies and then hangs around rotting on my skin. Here she is plump and delicious ... in full bloom and laid down next to a bar of 100% cocoa dark chocolate. This effect is more than likely due to the addition of Tonka Beans creating a 'smooth' vibe. This note seems to be missing from the above pyramid, but I will take the word of my astute friend AromiErotici down below and work from his fuller pyramid. Indeed, their reminiscent fragrance of vanilla, almonds, cinnamon, and cloves are subtly present when I lift my wrist to my nose ... a definite olfactory treat. Now, one would think that this fragrance would then veer toward the gourmand, which it does not. It retains enough bitterness leaving it just on the acceptable side of distasteful and rich enough to be interesting. "Sandalwood written in capital letters, full scale and life sized! Oboedi silentiis meis non imperii: “Do not obey my orders, obey my silence”. Turning powdery under the influence of bitter cacao, the sandalwood plunges deep into a velvety trap." Hmmm ... if this is Sandalwood written in capitals then I'm a real girl and not a drag queen! The wood here plays second fiddle to the Rose (velvety trap?) in typical Lutens fashion ... with this house I have come to realize that what you see is not necessarily what you get. That said, I find myself enjoying Santal Majuscule. Perhaps I'm more for run of the mill niche fragrances than for those that push the envelope too hard. The long-awaited arrival of another creation from Serge Lutens has come to fruition. I sat with bated breath in anticipation of something new from the spice master himself. This Fall's release however was an unfortunate experiment with a huge lack of creativity entitled Santal Majuscule. Santal Majuscule invokes memories of so many other important Serge Lutens fragrances it make me dizzy. The opening gets underway with the signature dry, aromatic Serge Lutens' type sandalwood. Unfortunately, Serge has pull the pulled on the amp and this sandalwood is soft and virtually taciturn. 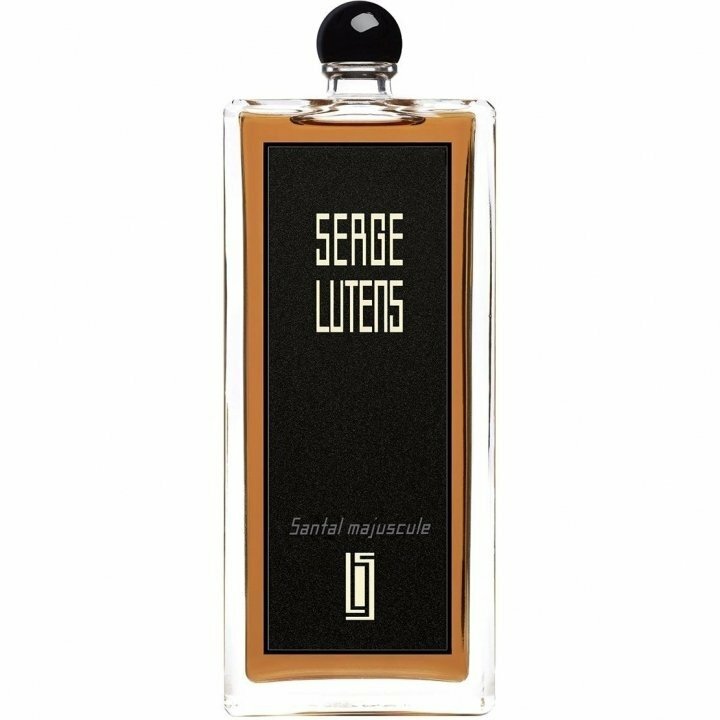 Generally speaking, Serge Lutens' sandalwood based fragrances live large but not so much in Santal Majuscule. The thing that troubled me the most was the similarity to, well, two or three of Serge Lutens' other fragrances. I found myself checking the label on the vial to make sure I wasn't sampling Rousse or perhaps Santal de Mysore. The heart note of cocoa brought me back to my beloved Five O'Clock Gingembre. It was if I were trapped in a time machine, being transported back to some other Serge Lutens masterpiece. The rose base was the only element of Santal Majuscule that was different and not so much the pretty rose in Sa Majesté la Rose. This rose was soft and supple and nicely paired with the cocoa and sandalwood. The rose element is something that I forgot completely about in only a few minutes. The dry-down was of many of the other Surge Lutens' fragrances previously mentioned, interesting but previously experienced. I hope that Santal Majuscule isn't an introduction to a long line of rehashed ideas. I would be thoroughly disappointed if the king of spice gives me nothing new to look forward except more of the same. Nubian guard and grande odalisque. Santal Majuscule is introduced by the brand as a big fat sandalwood, in capitals. The ingredient list is short: sandalwood, cocoa, rose (top/heart/base) For a start , even if the structure is far from linear, the ingredients are all noticeable from the beginning. As well, i would say that sandalwood is as important as the rose, but is the tannic cocoa what makes this fragance so captivating. The opening is, as expected, big and daring. Of course a rich sandal is there, but also a delectable honey note, cool spices (clove) and a golden yellow tea rose. The honeyed facet of the rose mingles with the sumptuous wood and hints of incense, and a slightly burnt note. I really love the sweet, bold opening of Santal Majuscule. This robustness continues as the tannin loaded cocoa unfolds. The puissance of the cocoa enrichens the sandalwood... for a moment i think i smell a high pitched patchouli, but i assume is the combination of cocoa and sandalwood and the rosyness, i am not sure. It is earthy and powerful. To round up i get a tobacco note when i get used to the cocoa. On each sniff i find a different facet of Santal Majuscule. The drydown is also beautiful: once the vigorous cocoa fades, the sandalwood brings its narcotic milkiness, and the rose illuminates: is fruity and indolent, like the blonde slumbering beauty of Ingres "Slave and odalisque" A note of beeswax acompanies the lactonic sandal. It lasts soft and gentle many hours on my skin. Santal Majuscule is very beautiful and well blended. Assertive, floral-woody, full bodied and with its dose of yummy. 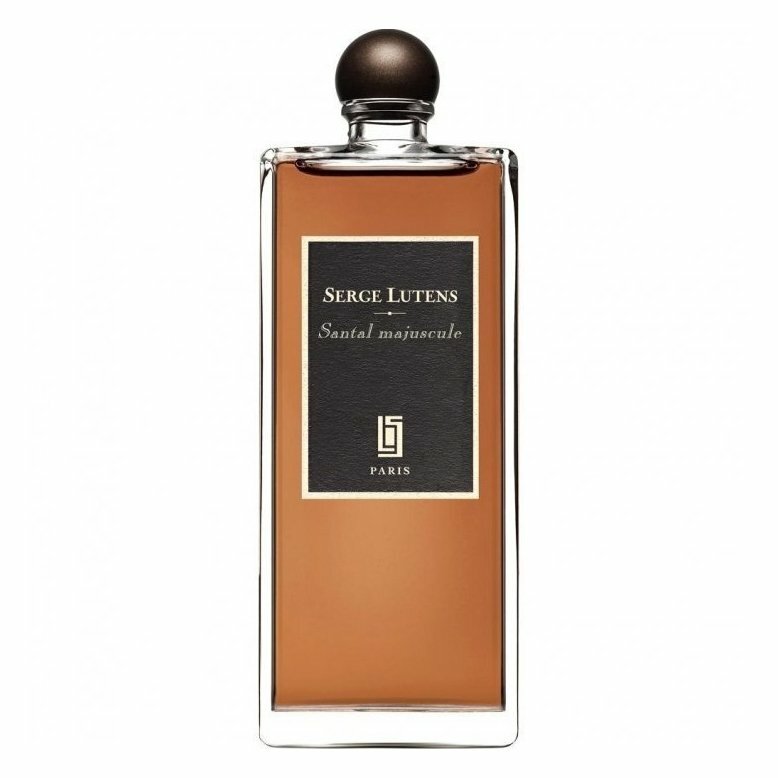 The cocoa/patchouli note immediately makes me think of L´Instant and Kokorico, but i find this Serge Lutens way more interesting and captivating, likable, easy to sell. It feels more traditionally masculine than femenine, but, as always we only care about this criterion in case we are buying a present for someone else. Well done, Lutens-Sheldrake. The beginning is delicious and terrific: gourmand chocolate.